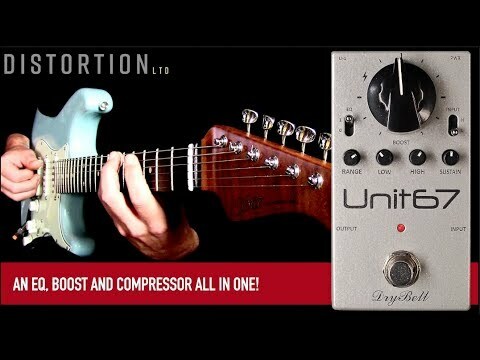 The Unit67 is a compact and fully analog device that has a highly versatile EQ set including a „Rangemaster-like“ mid control, a boost and an 1176 type of compressor – all in one extremely practical guitar pedal. When we started working on this pedal, we wanted to be as unique as possible in today’s pedal world and that was no easy task. Imagine getting THAT sound you have in your head from just one pedal. You know that playing feel when you play through a loud or overdriven amp, when every note comes out easily and you can play effortlessly? Well, that’s what the Unit67 is all about, only you don’t have to play LOUD or with an overdriven sound to get there. It doesn’t matter what your playing style is, how loud you want to play or whether you use any other pedals in your signal chain. The Unit67 is a versatile multi-functional tool which will improve almost every tone to the next, harmonically rich level. Unit67 gives you an exciting new playing feel and response which you’ll immediately love. Based on a clean (and semi-clean, read more) boost, which is the foundation for many guitar setups, we’ve implemented a very carefully tuned combination of fully analog features in the Unit67, useful to a wide range of musicians and playing styles. Also, our goal was to make it the simplest and most practical for the user. A boosted sound in itself is great, but you can get much more of it. Sustaining notes are often a big helping hand to guitar players, so we decided to implement the next great feature of the pedal: a Compressor. After serious development and inspired by the unique sound and feel of the 1176’s design, we’ve created our very own low noise compressor circuit for this pedal. It is transparent and it has a parallel compression circuit (blend), so you can add a right amount of sustain while retaining pick dynamics with just one simple knob (Sustain). Yes, you have DryBell’s take on the mighty 1176’s engine in this small box! You can find more about how we developed Unit67’s 1176-like compressor feature HERE! Of course, that was not the end of the Unit67’s journey. We’ve implemented additional controllability: an EQ set that consists of low and high controls and also a very specific sounding “Range” control. The Range (Master) control will help you cut through the mix and will enrich your tone with the glorious sparkle often associated with the old classic Rangemaster. In situations when you’re using darker toned amps or guitar pickups, “The Range” will always add a harmonically rich sparkle to your tone. Combined with a touch of sustain and boosted just enough to give you THAT tone, “The Range” will give some serious bite to your sound which is another way to push you through the mix while playing lead. Unit67 is a sublime combination of several effects working in perfect synergy! The main idea behind it came from experienced minds in two different fields: Zvonch, the DryBell founder and an expert electronics engineer, and Kruno, DryBell team member and professional guitarist with many years of live and studio playing time. We’ve combined the best of both worlds and after thousands of working hours with the rest of our team to make this design perfect, we’ve created something very special for you to enjoy. From the very beginning of the Unit67, starting with the first breadboard prototype, we were simultaneously developing and rigorously testing it with a ton of different amps, pedals and guitars and no matter what setup was used, it benefited from the magical touch of the Unit67. Besides that, the learning time to get comfortable with Unit67 is virtually non-existent and within a few seconds of playing, you’ll find instant satisfaction. With all that being said, it has been a challenging but fun two year journey for us and now it’s up to you to try the Unit67 for yourself. Prepare to be amazed! Within each Unit67 box purchased directly from DryBell, you will find a nice gift for you – a handmade leather DryBell keychain pick-holder!